Necrotising fasciitis is a rapidly progressing soft-tissue infection, which has historically been linked to penetrating trauma in war times . Paediatric textbooks did not mention necrotising fasciitis before 1973 [2, 3] despite the first case of necrotising fasciitis in a child  being reported just six years after the initial description in adults . Selective literature reviews dealing with necrotising fasciitis in childhood usually deduce their recommendations from small case series or reports on adults [6–9]. In them, considerable research effort has been made to analyze necrotising fasciitis on a population based level , for specific patient groups at risk for necrotising fasciitis , and to facilitate early diagnosis [12–14]. We identified five studies that reported population-based on incidence and case-fatality rates in 68 cases [23, 25, 26, 28, 29], two case-control studies with 27 cases [30, 31], and another 298 cases from 195 case series and case reports [2–4, 8, 27, 32–221] (Fig. 1). We aimed to identify features specific to necrotising fasciitis in children by a systematic review. 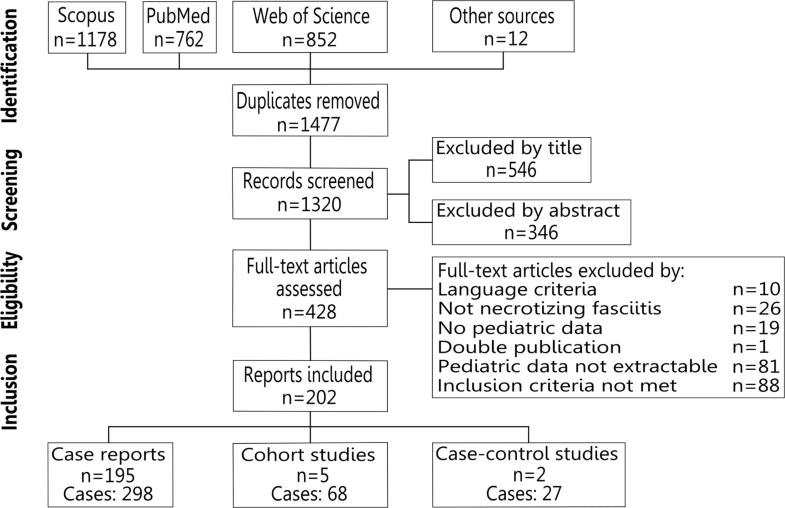 Whereas necrotising fasciitis had been subject to intensive research efforts in adults, knowledge on necrotising fasciitis in children is scarce. We identified four studies reporting population based incidences and case-fatality rates, of which two were prospectively conducted. Moreover, three of them were limited to cases of necrotising fasciitis caused by group-A streptococci and had a narrow geographic focus: Either a Canadian province , states within the United States of America [23, 29] or the referral area of Finnish university hospitals . Only one report assessed necrotising fasciitis on a nationwide level  and included cases caused by other organisms than group-A streptococci. This might represent an accurate estimation of the burden of disease for an industrialised country. Necrotising fasciitis may be more common in developing countries as indicated by a monocentric Nigerian prospective observational study: It included 32 cases of necrotising fasciitis in childhood within 4 years . Although 20 cases were neonates - leaving 12 children - the report  still hints at higher incidences in low-income countries. Moreover, all of these children presented with tissue necrosis  indicating an advanced disease [9, 222]. Similarly, ecchymosis and necrosis were found in 72% of cases in the other large case series . In contrast to these late-appearing skin symptoms, pain, erythema, swelling, and - to a lesser extent - splinting were predominant skin symptoms in both case-control studies [30, 31]. The analysis of skin symptoms within the pooled cases did not identify highly frequent lesions: Only erythema had been noted in more than a half of the included cases and swelling in almost a half of the affected cases despite an advanced stage of disease - evidenced by either ecchymosis or necrosis - in 40.6% of the cases. This result may be explained by recall bias: The lack of clinical information that has been present in the patient, but was not documented in the patient’s file and thus not included in the published report . Consequently, the more subtle skin symptoms might not be documented in light of the more dramatic changes such as necrosis or discolouration. Recall bias is also likely to have affected the signs of systemic illness within the pooled cases. Signs of systemic illness had similar frequencies among the pooled cases with the exception of fever in 76.6%. This percentage was smaller than the 100% reported in both case-control studies, and the 92% in the largest report on paediatric necrotising fasciitis . Frank et al. suggested that necrotising fasciitis would often go hand in hand with normal white cell counts combined with pronounced bandemia, whereas others associated necrotising fasciitis specifically with increased white cell counts . In both case-control studies, white cell counts did not differ from those in patients diagnosed with cellulitis [30, 31]. Within the pooled cases, 49.5% had leukocytosis, 17.3% leukopenia, and 22.9% bandemia, of which the majority were found conjointly with leukocytosis. However, leukocyte counts are not part of the paediatric laboratory risk indicator for necrotising fasciitis, developed to differentiate cellulitis from necrotising fasciitis: Only C-reactive protein and sodium levels below 135mmol/L were found to be of relevance . An abnormal leukocyte count or temperature are required to diagnose systemic inflammatory response syndrome, which occured in 65.1% of the pooled cases. A recent case-control study has shown that fever, tachycardia, and tachypnea might be used to differentiate necrotising fasciitis from abscesses or cellulitis . Thus, a systemic inflammatory response syndrome conjointly with the combination of the most frequent skin symptoms from the case-control studies - swelling, pain, erythema, and probably splinting - might be predictive for necrotising fasciitis. Due to the limitations of the data included in the systematic review, this symptom combination needs to be evaluated for its predictive value before recommendations can be made. Predominant involvement of extremities followed by lesions on trunk and head was a common picture within all included studies. It also is in line with other reports  and adult data [11, 225, 226]. This is different concerning polymicrobial necrotising fasciitis: Previously, polymicrobial infection was commonly reported in paediatric necrotising fasciitis in developed  as well as developing countries [16, 17]. Among the pooled cases, in contrast, necrotising fasciitis was usually monomicrobial, which has previously been attributed to necrotising fasciitis following primary varicella infection [30, 31, 222]. Whether the pooled cases provide an accurate estimation of the distribution of mono- and polymicrobial infections needs to be assessed at a larger scale. In particular, Gram-negative rods isolated from wounds may depict a changing spectrum of necrotising fasciitis with a transition of risk factors from primary varicella towards immunocompromised or operated patients. Introduction of varicella vaccination resulted in reduction of the case load of necrotising fasciitis caused by group-A streptococci [228, 229]. Again, these results have to be validated by large scale studies. The necessary information seem to be available in certain databases as the negative association of both Streptococcus spp. and Staphylococcus spp. with case fatalities  could not have been calculated without knowledge of isolated germs. Case fatality rates have been  and still are high in adults [10, 226], but lower or absent in children [16–18, 222, 227, 230]. Higher case fatality rates of 14.3%  and 10%  have likely been influenced by small sample sizes as the case fatality rate was only 2.85% in the only cohort with more than ten patients . Case fatality rate was 10.4% within the pooled cases and thus higher than in the aforementioned studies. Similarly, the number of cases that required a skin graft was 51.6%, which largely exceeds the previously reported values of skin grafting [17, 230]. There has been considerable variation within the literature: From skin grafts being exceptional  to institutions where skin grafting is the regular treatment modality for skin defects following necrotising fasciitis . Probably, necessity for skin grafts was determined by extent of debridement and may thus have influenced the number of skin grafts. Different thresholds for using skin grafts could also play a role. Besides the already mentioned recall bias, several other limitations need to be taken into account for data from case series and case reports. Usually, case reports and series have an exorbitantly high success rate. Either due to preferential reporting of successful results  or an over-representation of specialised centres , whereas terrible results are scarce and those in between almost non-existent. The extent of this bias is however unclear as an assessment of case series included in Health Technology Assessments of the National Institute of Clinical Excellence of the United Kingdom found no differences in reported outcomes compared to randomised controlled clinical trials on the same subject . Nevertheless, the results from the pooled cases have to be interpreted cautiously and thus require validation by studies of higher quality. Despite the relevance of necrotising fasciitis and its potential grave consequences for the future life of children, these studies are missing. Likely due to the rarity of necrotising fasciitis for the individual institutions, which could be overcome by multiinstitutional collaboration.